It’s been a very busy week so far and I am just grabbing the chance to write an ultra quick update on the run. 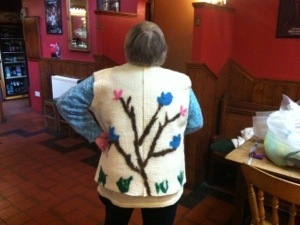 The ladies I felt with in Borris Active Retirement Group completed outstanding pieces in our session on Monday afternoon and if you check out my recent Facebook updates I have uploaded all the current pictures there, sorry I haven’t yet mastered the art of doing this using the phone. My back kitchen/garage/larder restructure is almost complete so by Monday I hope to be back in the studio and felting like crazy once more! Tonight I collect Istvan Vidak with Carmen and tomorrow I will be cooking lunch for everyone and helping with the exhibition opening, I am really looking forward to seeing Istvan’s beautiful felt. 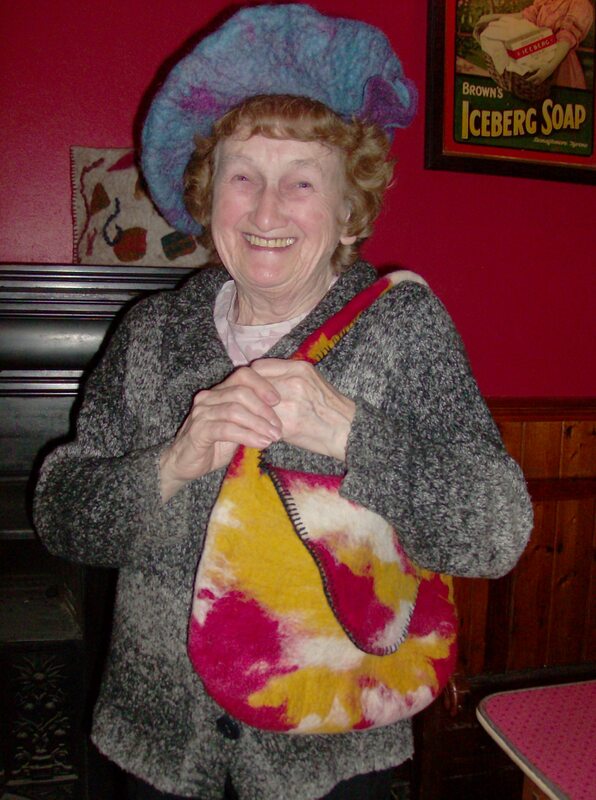 Beautiful bags, hat and jacket in progress this afternoon …..
After a really busy morning manhandling the cupboards in my old utility room I spent a very enjoyable afternoon in Borris with the felting ladies from the Active Retirement Group. This is now my fourth session working with the group and we had a 3 hour session today in order to get some bigger projects underway. 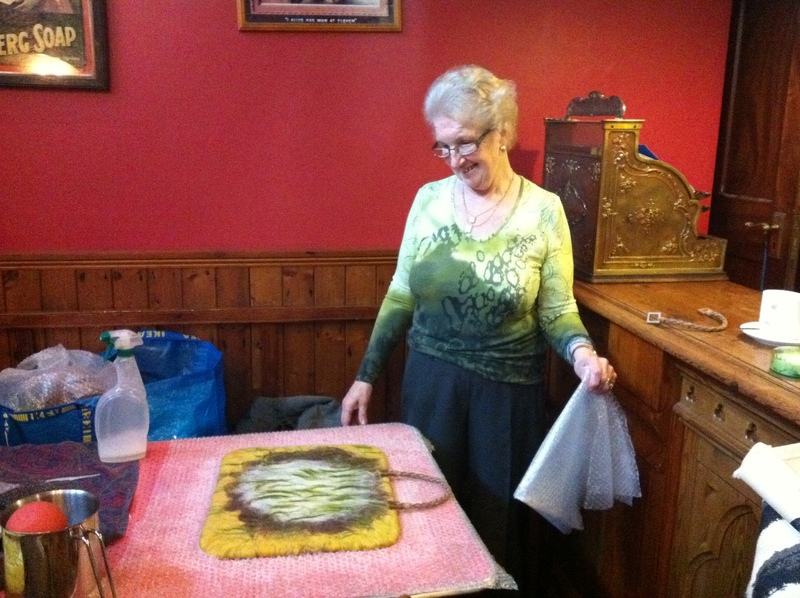 Dorothy is felting a body warmer, Betty a hat and Myna, Una, Jo, Ann and Mary are all felting bags, some with integrated handles and all with optional inside pockets! Jo’s bag is almost finished, Dorothy’s first large piece of yardage is done and everyone else is at the rubbing and rolling stage with their bags. I’m EXHAUSTED now so I’m just going to leave you with a picture of Mary’s bag when it was laid out and a close up view, the handles are going to be wonderful with it! ‘Till tomorrow …..
Mena’s beautiful felt beret and large bag! As mentioned in the last post Borris Active Retirement had a ‘show and tell’ exhibition last Wednesday and I think this great picture of Mena with her felt beret and large bag sums it all up! Still having ongoing computer problems (and now no anti virus protection) so apologies for the short post, they will be this way until things are finally sorted, hopefully by the weekend if all goes well. Mena's beautiful beret and bag with integrated handle! 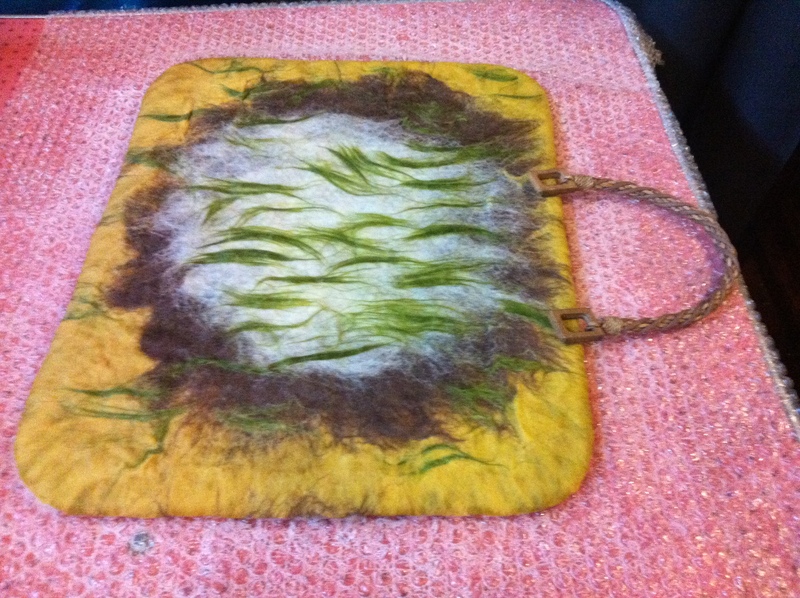 Nuno felt, show and tell, picture of the beautiful felt bags created at the workshop on Saturday! It is 14.52 as I sit down to write this post and although I had planned to felt from dawn to dusk today I haven’t managed to get one piece of wool or silk laid out yet, UGH!!! I have decided to keep this brief …..
My project for the day is a nuno felt collar. Borris Active Retirement had a fantastic ‘show and tell exhibition’ last Wednesday – I am currently downloading all the pictures that I have been emailed from the afternoon and hope to upload them to Flickr tomorrow. 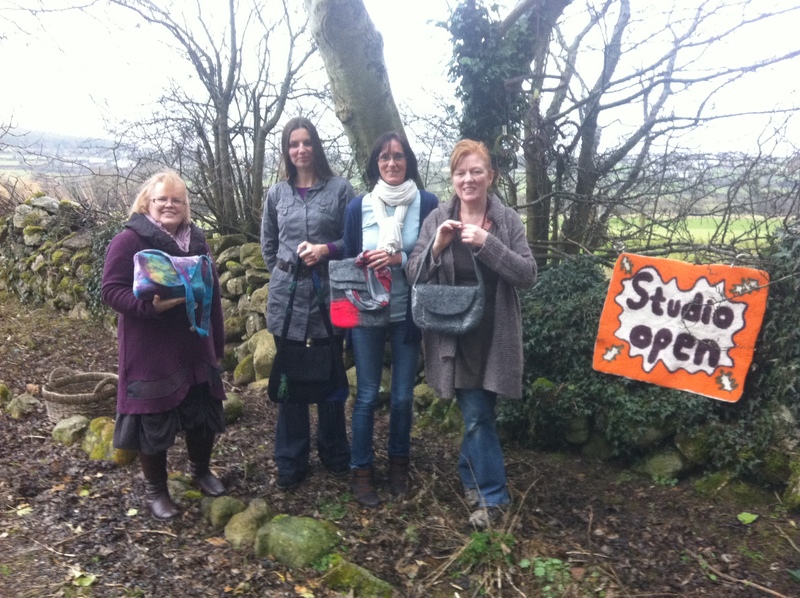 Saturday’s felt bag workshop was brilliant and unfortunately the following photo does not do either the participants or the bags full credit! It was lashing (wet and windy in Irish!) when we had finished, photography was difficult and two of the bags need a little bit of finishing. I’m guessing you will get the idea anyway, I was so impressed with the individuality of the work and will blog properly about our day next time I get a minute. Agnieszka has already posted a couple of pictures about the progress of her bag to her blog and I am guessing we might get a clear picture of the finished bag there before very long. Her spinning and dyeing is like eye candy anyway so I think that you will enjoy browsing her work even if it is a few days before the completed bag is revealed!!! My computer is really having some problems so I am on call for a friend to take remote control once more while he removes everything that is loaded on it and hopefully starts from scratch to iron out all my issues! Mary, Agniezszka, Gerd and Helena with their wonderful bags! 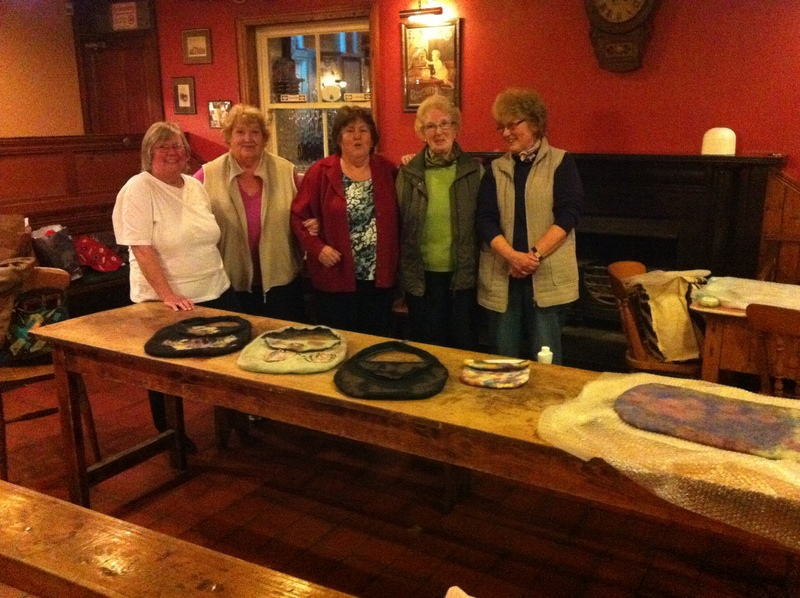 Dorothy, Betty, Una, Mary and Ann behind their fabulous bags! Time is of the essence at the moment, apologies for the lack of words but do head over to look at yesterday’s photos and here is one of my little vessel inspired by the ancient stone walls around me. 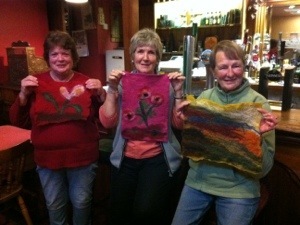 I have just uploaded a load of photos from our wonderful afternoon yesterday to Flickr, Mena, Dorothy, Betty, Mary and Ann choose to felt large bags with integrated handles, Una a kindle cover and Helen a needle felted landscape into a wet felted background for this, our final session of the current series. It is fantastic to review just how much knowledge the Borris Active Retirmement ladies have learnt during the last year, we have had three series of 12 hours each and by now all the participants are able to felt quite complicated bags, hats and vessels using the resist method, flat felt landscapes, needle felt embellishments and beautiful fun jewellery and accessories. Everyone seems a dab hand with a needle so much of the work has been embellished with stitching and beading at home, beautiful teapot covers, bags and cushions have been stitched, lined and finished as the pictures on Flickr show off to best advantage!!! Little felt vessel and Horst’s workshop almost booked out already! 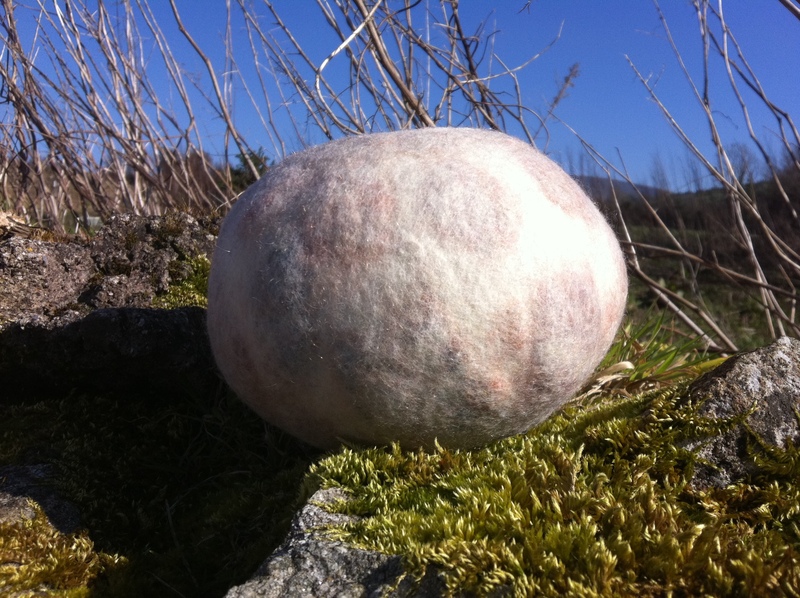 Just a really quick post, I felted a gorgeous small vessel on Friday and Horst’s workshop is almost booked out already! Pictures of the vessel tomorrow, off now to load the truck and meet the ladies for Borris Active Retirement’s last session today. Apologies to anyone waiting for a reply to an email, I’ll get you later tonight!! !